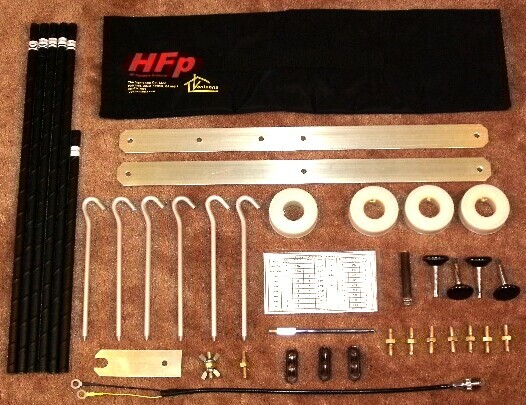 The HFp-Vertical kit comes with all the parts required to set the antenna up on the Ham bands from 40M through 6M, including base plates, radial wires, guy lines, a coax pigtail, and a laminated card which shows the configuration for each Ham band. You don't need to buy anything else! Options include an add-in coil which allows tuning the antenna to 60M, 75M, and 80M. Other options are a Clamp Mount, a Backpack Mount, and a Mobile Mount adapter. Plus, there is an upgrade available to allow the HFp-V to be set up as a dipole. A note of special thanks to Roy Veimoen, LA6LOA for the beautiful picture of the HFp-V on a hill near his home in Harstad, Norway, seen on our home page. A note to CAP and SWL enthusiasts - This antenna is so configurable that it can actually be set to resonate at ANY frequency between 6.5 and 35 MHz.